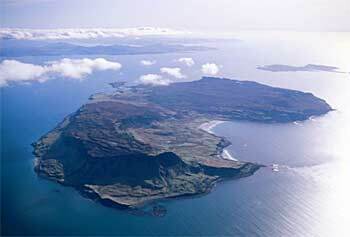 Eigg is 9 km (5.6 miles) long and 5 km (3.1 miles) wide, making it the second largest of the Small Isles after Rum. It is dominated by the 393 m (1,289 feet) peak of An Sgurr (the rocky peak), a dramatic pitchstone ridge, the largest of its kind in Europe, clearly visible and recognisable from the mainland. Eigg boasts the first completely wind, water and sun-powered electricity grid in the world, due to the pioneering community on the island who are continually aiming to reduce their carbon footprint. A macabre story relates the meaning behind the name of one of the caves on Eigg’s south coast – the Massacre Cave. 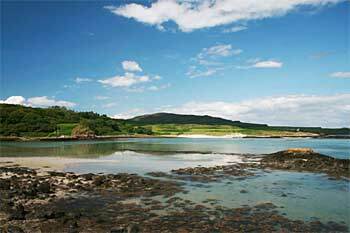 According to local legend, a party of MacLeods visited Eigg in 1576 and the men allegedly made unwanted advances towards the local girls. As a result, the men of Eigg rounded up the MacLeods and sent them off the island in an open boat. The youths were eventually rescued by some fellow clansmen but they vowed to return and take their revenge. The following spring they did just that. The Eigg islanders saw a large flotilla of MacLeod birlinns, with several hundred men under the command of Alasdair Crotach and his son William, approaching from Skye. All the residents fled to a secret cave on the islands’ south coast – Uamh Fhraing (the cave of Francis). The entrance to the cave was low and covered in undergrowth, but the entire population managed to crawl inside into a larger cavern where they hid. The MacLeods searched the island for two days, with no success. Frustrated, they decided to return to Skye. As they sailed from the shores of Eigg one of the MacDonalds left the cave, climbed to the top of the hill to see if the coast was clear, but was unfortunately spotted. Making his way back to the cave he left tell-tale footsteps in the snow which enabled the MacLeods to trace the islanders’ hiding place. Ruthlessly, they piled thatch and roof timbers at the cave entrance and set fire to it, damping the flames so that the cave was filled with smoke. Three hundred and ninety five people died, either by smoke inhalation or heat and oxygen deprivation. Only one family managed to escape to tell the tale. Almost 250 years later Sir Walter Scott visited the cave and found human bones there. More recently, in 1979, a boy on holiday visited the cave and found a human skull. It was gifted to Birmingham Museum. Clearances started on the island when landowners realised they could earn more from sheep than people and consequently many inhabitants were forced to leave the island. The ruined villages of Upper and Lower Grulin under the Sgurr bear testimony to that harsh period of Highland history. Fourteen families used to live there before they were forced to emigrate in 1853. Farms were divided into much smaller crofts, as in Cleadale, where each parcel of land is enclosed by walls which run from the cliffs to the sea. Old patterns of settlement still show under these crofting boundaries. Many islanders left at this time, unable to obtain land or work. Today, only the north end of the island remains a crofting area. Laig Beach was used as commando training in WWII as practise for the Normandy landing. The Lodge and its extensive gardens were built in the 1920s by a wealthy ship owner, Lord Runciman. Eigg has known a long history of instability under owners who did not encourage a community spirit. During the 1980s many incomers arrived on the island and tried to rebuild the community, but it wasn’t until 1997 that the islanders bought the island themselves and since then the economy has become more stable and the population has grown. There are increased employment opportunities and therefore reasons for young people to stay on the island and there are currently about 90 people living on the island. 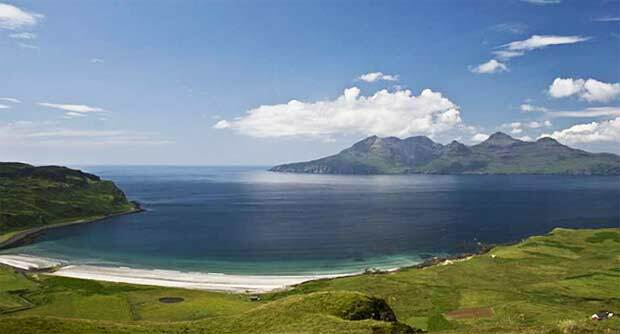 Eigg offers excellent facilities for its many visitors without being tarnished by the growth in the tourist industry. There is a craft shop, restaurants, a grocery shop and cycle hire. Feis Eige is held annually in July, a week of family activities including a ceilidh at the end of the week. In 2004 the pier on Eigg was extended to allow a roll on/roll off ferry to berth there. Prior to this it was necessary for passengers and freight to be transported on a transfer boat. In 2008 Eigg joined the national grid. Before that the islanders had to supply their own power through noisy generators. The island’s electricity is now entirely supplied from renewable sources (wind and solar). In January 2010, the Isle of Eigg community won joint first place – and £300,000 – in a competition to find new and better ways to tackle climate change, run by the National Endowment for Science, Technology and the Arts (NESTA). 196 species of birds have been recorded on Eigg, with about 130 species being seen in a typical year. Approximately half of that number breeds on the island. Golden Eagle and Red-throated Diver are two of the more spectacular species to be seen here, but with a wide variety of habitat available, there is a diverse range of species from woodland inhabitants to wading birds which frequent the shoreline and birds of prey which roam the uplands. The variety in habitat also means plant life is abundant and diverse. Twelve species of orchid grow on the island and the island cliffs are home to a good cross section of Alpine and Arctic species such as Mountain Avens and saxifrages. Eigg is a good place for whale and dolphin watching as well, with Minke whales regularly been seen in the summer months. As well as nature watching, the island has several colour coded walks with an accompanying leaflet and map to aid hikers. The beach between Laig Bay and the Singing Sands on the west of the island is a geological paradise with many interesting rock formations. Eigg is a gentler, more accessible and hospitable island than neighbouring Rum, smaller, but with a larger population. There are still challenging walks here, but it is arguably more of a family-friendly location than its larger neighbour.